“One of every three women will die of heart disease,” says Donna Arnett, Ph.D., chair of the Department of Epidemiology in the UAB School of Public Health. Arnett, who is president-elect of the American Heart Association, says one in eight women get breast cancer and as many as 94% survive, yet women are more afraid of cancer than heart disease. “I think with all the media coverage of breast cancer, women are unaware that heart disease actually kills more women, young and old,” Arnett says. “For some reason women still don’t perceive themselves to be at risk for heart disease,” says Vera Bittner, M.D., professor of medicine in UAB’s Division of Cardiovascular Disease and section head of Preventive Cardiology. “Women see it as a men’s disease, and they are more likely to interpret chest discomfort as coming from indigestion instead of a heart attack,” says Bittner. 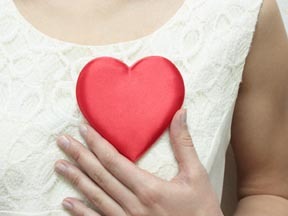 Symptoms of a heart attack in women also may differ from those in men. “Many women may not have the classic chest pain or jaw discomfort. Women may often have more nausea and vomiting or back pain than men,” Arnett says. To combat the onset of the disease, Arnett points to the Life’s Simple 7 plan, which focuses on managing blood pressure, reducing blood sugar, quitting smoking, losing weight, getting active, controlling cholesterol and eating better. “Women need to take as much care of themselves as they do for their families. You cannot put yourself last, but women tend to do that,” Arnett says. But during American Heart Month, Arnett and Bittner want to draw attention to the good news about this disease — it’s preventable. The heart-healthy focus needs to start as young as childhood, Bittner says. Any risk factors you have as a kid can become exaggerated as an adult, she says. “We like to do primordial prevention, which is prevention of risk factors themselves. In the younger age groups the focus needs to be on lifestyle — getting regular exercise, having a heart healthy diet, maintaining normal weight and staying away from smoking,” Bittner says. “If you make it to age 50 with normal cholesterol levels, are non-diabetic, not hypertensive or overweight, have a healthy diet, get physical activity and have never smoked, then your chances of developing heart disease are close to zero,” Arnett says. But if you don’t get to that magic number without some bumps in the road, both doctors advise you not to despair — it’s almost never too late to start focusing on heart health.